The Morningstar® Wide Moat Focus IndexSM (MWMFTR, or “U.S. Moat Index”) outpaced the broad U.S. equity markets as represented by the S&P 500 Index (3.66% vs. 3.21%) in February. Tech companies became a more prominent exposure in the U.S. Moat Index following the December index review, and the sector represented an outsized portion of the U.S. Moat Index’s return for the month, similar to the broad market. Consumer staples companies were also strong contributors for the month, and all sectors posted positive returns. The lone real estate company in the U.S. Moat Index, Jones Lang LaSalle, Inc. (JLL, +15.14%) was the largest contributor to returns in February. JLL’s stock price surged in mid-February after the release of 2018 earnings results that beat consensus estimates. Morningstar’s equity research team believes the company is better prepared to weather potential downturns now than it was during the Great Recession. This is not the first time JLL has been in the index portfolio. As recently as 2016, JLL was viewed by Morningstar as undervalued and was added to the index. It was later removed as its rising stock price moved more inline with its declining fair value estimate. JLL returned to the U.S. Moat Index in September and December 2018 after a sell-off that began in early August. According to Morningstar, JLL benefits from intangible assets, the leading source of moats, due to its brand. A positive brand can play a key role in helping companies stay ahead of competitors by promoting sales, building trust, and inspiring customer loyalty. Morningstar’s analysts believe JLL’s brand helps the company attract both clients and talent. This commentary is not intended as a recommendation to buy or to sell any of the sectors or securities mentioned herein. Holdings will vary for the MOAT ETF and its corresponding Index. For a complete list of holdings in the ETF, please click here https://www.vaneck.com/etf/equity/moat/holdings/. Fair value estimate: the Morningstar analyst’s estimate of what a stock is worth. Price/Fair Value: ratio of a stock’s trading price to its fair value estimate. 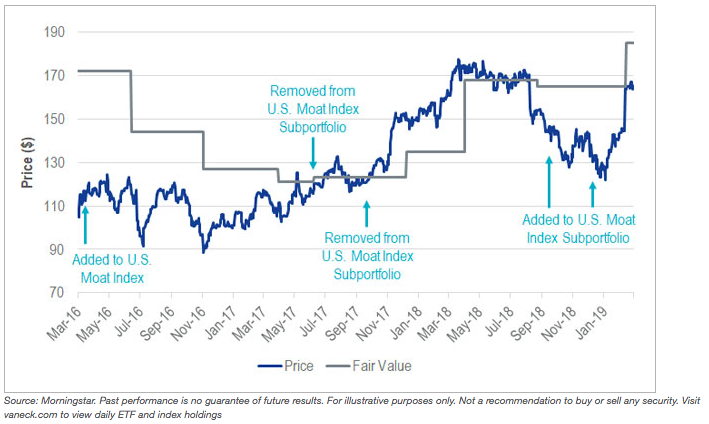 The Morningstar® Wide Moat Focus IndexSM was created and is maintained by Morningstar, Inc. Morningstar, Inc. does not sponsor, endorse, issue, sell, or promote the VanEck Vectors Morningstar Wide Moat ETF and bears no liability with respect to that ETF or any security. Morningstar® is a registered trademark of Morningstar, Inc. Morningstar Wide Moat Focus Index is a service mark of Morningstar, Inc. 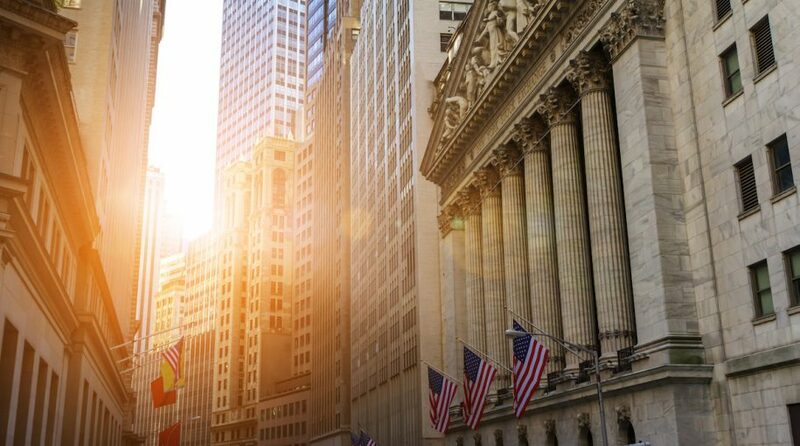 The Morningstar Wide Moat Focus Index consists of U.S. companies identified as having sustainable, competitive advantages and whose stocks are attractively priced, according to Morningstar. S&P 500® Index: consists of 500 widely held common stocks covering the leading industries of the U.S. economy. Effective June 20, 2016, Morningstar implemented several changes to the Morningstar Wide Moat Focus Index construction rules. Among other changes, the index increased its constituent count from 20 stocks to at least 40 stocks and modified its rebalance and reconstitution methodology. These changes may result in more diversified exposure, lower turnover, and longer holding periods for index constituents than under the rules in effect prior to this date. The S&P 500 Index is a product of S&P Dow Jones Indices LLC and/or its affiliates and has been licensed for use by Van Eck Associates Corporation. Copyright ©2019 S&P Dow Jones Indices LLC, a division of S&P Global, Inc., and/or its affiliates. All rights reserved. Redistribution or reproduction in whole or in part are prohibited without written permission of S&P Dow Jones Indices LLC. For more information on any of S&P Dow Jones Indices LLC’s indices please visit www.spdji.com. S&P® is a registered trademark of S&P Global and Dow Jones® is a registered trademark of Dow Jones Trademark Holdings LLC. Neither S&P Dow Jones Indices LLC, Dow Jones Trademark Holdings LLC, their affiliates nor their third party licensors make any representation or warranty, express or implied, as to the ability of any index to accurately represent the asset class or market sector that it purports to represent and neither S&P Dow Jones Indices LLC, Dow Jones Trademark Holdings LLC, their affiliates nor their third party licensors shall have any liability for any errors, omissions, or interruptions of any index or the data included therein. An investment in the VanEck Vectors Morningstar Wide Moat ETF (MOAT®) may be subject to risks which include, among others, investing in the health care, consumer discretionary, industrials, financial services sectors, medium-capitalization companies, equity securities, market, operational, index tracking, authorized participant concentration, no guarantee of active trading market, trading issues, passive management, fund shares trading, premium/discount risk and liquidity of fund shares, non-diversified, and concentration risks, which may make these investments volatile in price or difficult to trade. Medium-capitalization companies may be subject to elevated risks. Investing involves substantial risk and high volatility, including possible loss of principal. An investor should consider a Fund’s investment objective, risks, charges and expenses carefully before investing. To obtain a prospectus and summary prospectus for VanEck Funds and VanEck Vectors ETFs, which contains this and other information, call 800.826.2333 or visit vaneck.com. Please read the prospectus and summary prospectus for VanEck Funds and VanEck Vectors ETFs carefully before investing.